Courtesy of Kuper Sotheby’s Int’l Realty, Susan Hallmark. 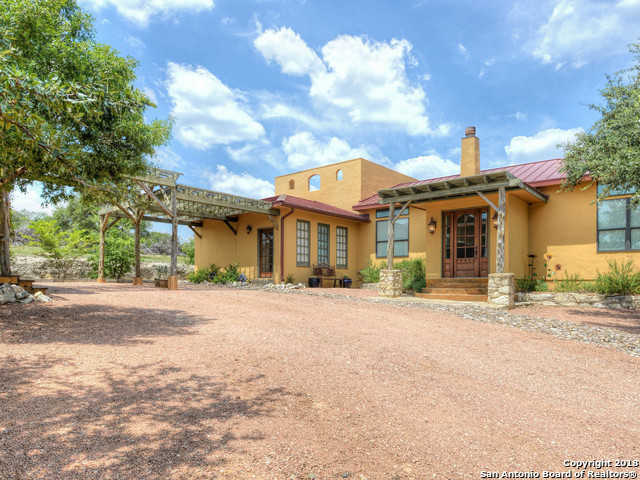 Hill Country Hacienda-Custom designed, hand troweled stucco one story home plus 1020 sq.ft guest house. Home has plaster walls, windows galore to view the hills, Spacious great room with interior cedar logs separating areas within the great room for the dining and breakfast areas, sunny and colorful interior accented with art niches, Wildlife Exemption, GUEST/ARTIST STUDIO SEPARATE. 55 ACRES, BEAUTIFUL VIEWS!